I wanted to do something with gold this weekend and chose to pair gold with green for the traditional appeal it has and which is why it's one of my favourites too. 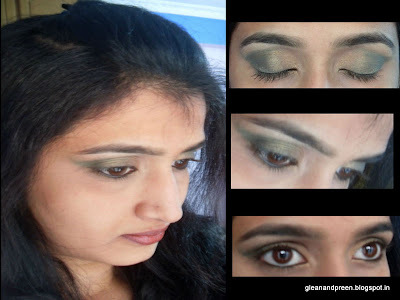 Go Green: Take a green eye pencil, line the outer V and crease of the eye and fill till 2/3rd of the lid. Leave gaps as shown in the picture. Smudge: Using a Smudger blend the green color as shown. This forms a shaded base for the outer 3/4th of the lid. Pat & Blend: Pick-up a golden green eye-shadow, pat and blend on the entire shaded green base leaving the 1/4th part near the inner corner. Pick up a gold eye-shadow and swoop along the entire crease starting from the outer corner. Also fill the remaining 1/4th with the golden eye-shadow. Keep blending the remaining gold colour on the brush into the green base on the outer corner. Apply Kajal and line the lower lashline with the gold eye-shadow. Mascara Time: Last apply 2 coats of mascara on curled lashes and you are done. Optionals: Black liner on upper lash-line and false lashes to add the oomph factor. What's on my face today? Ulta Eyeshadow (Cognac & Olive), Lotus Herbals Pure Radiance Matte-Glow Daily Foundation(Soft Biege), Chambor Silver Shadow Compact, CoverGirl LashBlast Volume Waterproof | Hydrafuge Mascara, Avon 2 in 1 Kajal, Faces Long Wear Eye Pencil(Forest Green), Avon Ultra Color Rich Lipstick(Amethyst). Accessories used were Ulta brushes and an unknown brand's curler. Vish its a pretty eye mkaeup :) and u look so sweet.